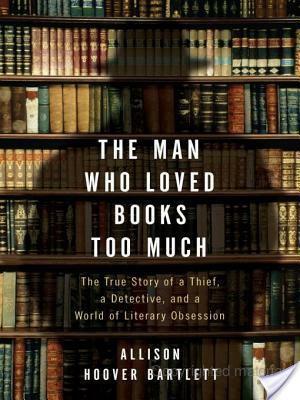 The Man Who Loved Books Too Much by Allison Hoover Bartlett is a work of narrative non-fiction. This means it’s most likely not going to be a snooze like your earth science textbook! I think that anybody reading this review most likely loves books. If you don’t love books, why oh why are you on a book review blog? To introduce the synopsis of The Man Who Loved Books Too Much, I just want to ask a few questions. What lengths would you to in order to obtains books? Would you steal? I know most of you would not, we love books too much to violate them like that. The main person profiled in this book is John Gilkey. Gilkey was so obsessed with books, he would go to incredible lengths to steal them. To me, Gilkey was reprehensible. I felt he was something of a sociopath, in that he had no remorse about his actions. He felt the rare book dealers were out to get him, because they had all of the rare books he wanted. Honestly, that’s messed up. To me, stealing books is just wrong. I felt this was a fascinating read. It started off pretty slowly, but as soon as we meet Sanders, the literary “detective” who was after Gilkey, the book got interesting. It was pretty hard to put down. I know, that’s a surprise and all, since this was non-fiction, but it was pretty decent non-fiction. I thought it was interesting that she placed books in the context of objects, and not as stories or ideas. Personally, I like the idea of books as sentimental objects, we all have that one tattered copy of a childhood favorite hovering on our bookcases, don’t pretend you don’t, either. However, I don’t think I would purchase a book just to own it, with no intention of ever reading it (reading it when I’m 30 does count). I thought it was pretty pathetic that Gilkey only cared about his library to impress others. I feel like books are meant to be read, not meant for objects of display or to impress people. Certainly, I understand collecting books, because you love reading. I have a few antique books myself (1916 edition of Treasure Island; 1906 edition of A Tale of Two Cities), collecting is wonderful. But stealing rare books to impress someone, that’s just wrong! I know, with that rant you probably think I didn’t enjoy this book, but I really actually did. I loved learning about rare book collectors and Sanders. While reading this book, I suggest you retire to the library with some brandy and cigars, ha ha. Not the public library mind you, do not walk in there with brandy and cigars. I just got this and will be reading it next! Thanks for the review to let me know what it will be like! You scared me for a minute…I have LOTS of books that I have bought but haven't read yet. I did buy them with the intention of reading them someday. I will get around to it! I've been like a stalker recently at used book stores, looking for certain titles that I know I could purchase at Chapters but the hunt for a great deal can be very exciting. I would never resort to stealing them, though. When you have limited funds to spend, it makes your choices that much more special right? How cool that you have those older versions! I wouldn't have appreciated that kind of thing when I was younger, but now I think it would be so cool to have the first or very early edition of a book! Great review! i don't know if this book is my kind of reading book u know? the story line sounds funny though, Stealing books?!? how can u even hide them? Come see what's at my site…You won my giveaway! How much fun would the library be if you could bring in brandy and cigars? Well, maybe not cigars; the smoke would probably be bad for the books. I suppose not the brandy either; well, not of me anyway cuz I get loud when I drink. But it would be fun! I just read this one and really enjoyed it too. I hadn't seen other reviews of it yet but figured I wouldn't be the only one to be sucked into the world of rare books and the crimes they inspire. This book sounds really interesting to me. I don't think I would ever steal a book. The act of reading a good story is what makes them really important to me – and occasionally who gave them to me. But possessing books for the sake of possession? Not really my thing. Still, I feel like it is a trend that's growing – using books to create a front, to look intellectual and refined. Does it work? Maybe for some, but definitely not for me. I love having a full bookshelf but only of enticing books that I plan to devour. I appreciated this book. I am one for years have had a relationship with books that goes beyond the understanding of the mind. When I was too young to read I slept with them. My mother was into accounting there was this one book that the page folded out about four times and all it had was numbers across the page…for some odd reason I felt power from it and would hold it close to my chest and then put it underneath my pillow to sleep with it. How’s that? I love books …..I will someday write one for my daughter and she will love it to.